White Elfa Décor Gliding Shelf is rated 4.9 out of 5 by 25. Rated 5 out of 5 by MakeMeOver from Sleek, functional, and classy. When i was designing my new Elfa system, I was immediately drawn to the gliding shelf. It looks just like the standard decor shelf, but when you need something sitting at the back of the shelf it becomes instantly easy to reach without knocking anything over. It gives a very sophisticated appeal to the system, and the walnut color is perfect for todays modern man. Rated 5 out of 5 by TNT8 from Amazing customizable system I just had a custom designed media center installed in my living room in Walnut and Platinum with these drawers as well as shelves. To begin with, the customer service was wonderful. They were friendly, took the measurements I provided, and we talked through my needs and wants. Then they came up with a brilliant design that does everything I wanted AND is modern and elegant. I had them install for me. It looked easy and Eddie was great! It was all done in about 1.5 hours. After watching, I do think I could've done it on my own. Overall the design make my tiny apartment feel bigger. It looks modern and elegant. The shelving is extremely sturdy and very easy to customize/move around. The drawers have a nice easy glide, and hold a lot of stuff. I highly recommend any Elfa product! Rated 5 out of 5 by LeeWhite1234 from Elfa Decor Gliding Shelf - Great I went back and bought several of these. I thought this was a silly purchase at first, but being able to easily pull out a shelf with my folded jeans and casual shorts and quickly find the one I want made me realize how practical and convenient this shelf is. No more bending over and looking through a stack of pants. Worth every penny. Rated 4 out of 5 by sail2sunset from TV stand I have an old Sony TV in the bedroom that still works so I don't want to replace it. Creating an elfa space for it was a brilliant idea. It finally looks like it has a home in the room. Rated 5 out of 5 by Marcellam from Elfa sliding shelf This unit is great for the laundry room as a folding counter. It tucks away when not in use and is easily accessible. Rated 5 out of 5 by ClosetHappy1 from Glad I added this to my closet! I'm so glad swapped out one of my ventilated shelves for the Birch elfa decor Gliding Shelf. I can pull the shelf out in order to rest a shoe box (while taking out or putting away a pair of shoes), or to fold a sweater, without having to leave the closet. When i'm done, I can just slide the shelf back into place, out of the way until I need it pulled out again. Very functional! Rated 5 out of 5 by Teeball33 from Gliding Shelf My walk-in closest in an Elfa and it is amazing! The gliding shelves are sturdy and quiet, and the design is beautiful. The installation takes time but is not complicated at all. Great product. Well worth the money, and the staff is a great help with design and suggestions for maximizing space. Rated 5 out of 5 by angelp from Glides smoothly These pull out so easily with just one hand. They are super smooth with no rough edges. Perfect for keeping things stored away that you don't use often but still easily accessible. Rated 5 out of 5 by jmc12 from helpful! The pull out is very helpful and very easy to move around when you decide to change the location. Rated 5 out of 5 by Pov95 from Useful My husband wanted this pull out shelf to be able to neatly fold his shirts and sweaters for stacking on his shelves. This was a great addition to our Elfa master closet. Rated 5 out of 5 by arlingtonshopper from solid This shelf is solid, slides out smoothly and easily, and looks great. Rated 5 out of 5 by sunnybrook from Love the Gliding Shelf I really love the Gliding Shelf. It makes it so much easier to access my folded sweaters and or t-shirts. 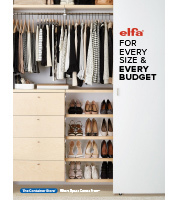 In addition, I LOVE my Elfa closet system. I can change things up, add or subtract as my lfie/clothing styles change. Thank you. Rated 5 out of 5 by Butterlady from smooth gliding These elfa gliding shelves have made my life easier! I can see what's on the shelf with just a gentle pull. They glide very smoothly, and they look great. Rated 5 out of 5 by flash from Desk Parts Love my new desk made with elfa parts. Built myself a customized computer desk. Rated 5 out of 5 by Smore from Perfect for a printer in a desk I absolutely love my gliding shelf. I have my printer on it so it saves space and can simply slide out when I need it. Love the design and simplicity, yet it goes so far to help you stay organized! Rated 5 out of 5 by ronaldar1 from Perfect! I just finished making an elfa entertainment center -- the gliding shelf is perfect for my record player. I'm reeeeeally happy with the way everything turned out! Rated 5 out of 5 by shopper353 from a place to fold my clothes replaced a solid shelf with this gliding one. It provides a nice surface for folding shirts, etc. Rated 4 out of 5 by DanG from Great Shelves -- Need instructions We bought these shelves to add on to our existing unit. They worked great once we found instructions online. Also, the instruction weren't in text format -- we had to watch an entire video to find what we needed. That said, very happy with these overall. Rated 5 out of 5 by emmapug from Great shelf These gliding shelves are so convenient in my hanging space -- it's great to be able to pull them out to set things down while I'm putting away laundry. They glide smoothly and are easy to install. Rated 5 out of 5 by Rosa from Awesome drawers! With these drawers in my closet, I don't have to move bulky dressers anymore!! They are strong, and the decorative molding gives it such an expensive look. This elfa has moved with me several times and saved me a load of money every time I reuse it. Can you install a closet rod under this shelf? Also, can you install two gliding shelves side by side? As far as the closet rod I don&rsquo;t see why you couldn&rsquo;t. The closet rod holders snap into the bracket and type of shelf should be irrelevant. As far as side to side these are self contained shelves so I don&rsquo;t see a issue in that regard. Does this gliding shelf require a drawer frame? If so, does it come with it? I don't see it mentioned anywhere in the information. No the gliding shelf snaps into the shelf brackets and ready to glide. how much weight will this shelf hold? We recommend to not exceed 20lbs for this item. do you have ventilated shelves that also slide? the metal shelving. can there be a mechanism put onto the shelves to make them glide? No, our elfa Ventilated Wire Shelves are all designed to be stationary. how far will shelf slide forward? Our elfa decor Gliding Shelf extends up to 12&rdquo;. Has anyone tried using this as a keyboard tray? Did it work well? This product could be used as a keyboard tray. Please note that if you rest your arms on the gliding shelf, it will tilt down a bit, which is not ideal. To discuss your idea in more detail, please contact our customer solutions department, or LiveChat with us. We recommend that the weight not exceed 20 pounds for each of our elfa d&eacute;cor Gliding Shelves. Can Decor shelves be cut down from 2' wide to 16&quot; wide? No, we are unable to customize our Elfa D&eacute;cor Shelves.